The Finest and Most Comprehensive Combustion Systems Available For Boilers, and Process Furnaces. WBC package burners are custom-engineered industrial fuel-burning systems designed for optimal combustion performance while providing safe, reliable, and user-friendly operation. WBC burners can be designed to fire nearly any gaseous or liquid fuel horizontally or vertically. Up to three fuels can be fired independently or simultaneously. 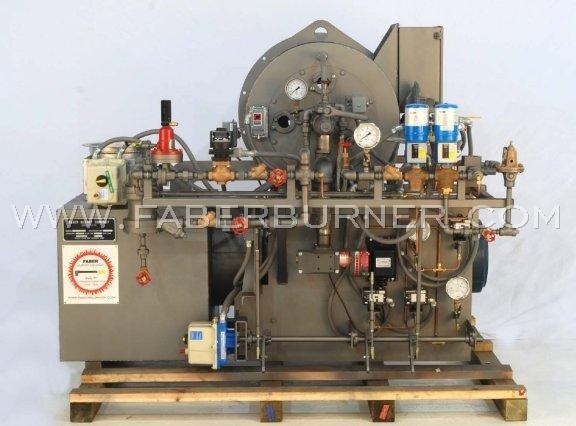 WBC package burners are available in single burner capacities from 10 to 300 MMBTU/Hr. This premium project-specific product arrives pre-piped, wired, and fully tested, ready for operation. Forced draft fans are typically remote mounted and combustion air is ducted to the circular windbox. The WBC can be designed for preheated combustion air. Liquid fuel and atomizing trains are typically burner mounted and gaseous fuel trains are remotely skid mounted. Burner controls for WBC package burners are typically remote. The design flexibility and the modular nature of Faber’s WBC package burner allows this product to be applied to any new or existing boiler/process heater regardless of make, model, age, or furnace design.